Operation Write Home requested photos or video from us to create a video to submit to ABC's Your Three Words project. 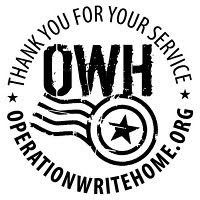 These 3 words are to express what Operation Write Home means to us. So I thought about it, what Does OWH mean to me? 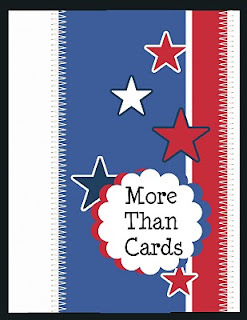 Why do I make cards and send them off, to be shipped to our troops serving throughout the world... There are many reasons. Its something I can do to support our troops. I feel connected to something larger than myself, when I think of these little cards carrying messages of love and hope and longing. I think of the happiness a simple card brings when sent between friends, and how many times that happiness must be multiplied when a card is sent between the one serving overseas and the ones supporting them here at home. There are stories posted on OWH's Facebook page from troops and from the happy recipients here at home about how these cards touch peoples lives. Children sleeping with notes from a parent; the gift of sharing a special holiday or anniversary; love letters. These are not just cards. They are hugs in an envelope, kisses snuggled between sheets of card stock, handshakes, high fives, whispers and confessions. Tangible connections - you know that your loved one held this card, that they took the time to write down a message, that they sent it with love. You can also know that someone made this card with this purpose in mind, gave their time and effort to create a container for these feelings. For You. When I make my cards, I make them with love, respect, and alot of gratitude. The sacra fices that are made by our troops, and the families they leave at home, are great. Though I make "just cards" I make them in the hopes that someones day is brighter, their sacrifice a bit more bearable, with the hope that their heart is warmed.